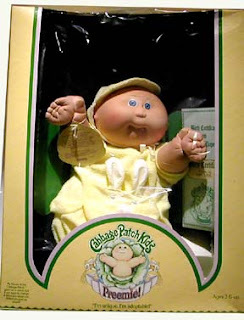 Like every child in 1980's, I had a Cabbage Patch Kid, courtesy of my Uncle Joe. The interesting thing about this fact is, I never really wanted one. Sure, it seemed like every girl in America wanted, needed, and had one or two... But I never really cared much for them. I didn't like playing house. I never enjoyed playing "mommy & baby." I preferred action figures, or even dolls that you could project unto, like Barbie or Strawberry Shortcake. Baby dolls did nothing for me. However, I did enjoy having Cabbage Patch Kid as a playground status symbol. Owning one made you fit in, and I wanted to fit in with the girls in my class so desperately. So I played with it in public. At home, it just sat on my vanity and stared at me. It was a little disconcerting, to say the least. However, it went from weird to downright horrifying not soon after. Now, something you must know about my mother, she loved reading trashy tabloids. The weirder the headline, the better. So it was not unusual to find the latest copy of the National Enquirer or Weekly World News in our shopping cart at the local Key Food. On one such trip, I found myself at the checkout with my mother as she glanced over the latest "Newspapers." A blurb on the cover of the National Enquirer mentioned a Cabbage Patch Kids collector. I found that interesting and picked it up to check out the article while we waited. The article went on to describe an obviously looney woman who could not have kids of her own, who had taken to "adopting" a slew of Cabbage Patch Kids and turning a room in her house into a nursery for them. She went so far as to purchase a baby monitor and schedule "feedings." She insisted they weren't really dolls, but real children that pretended to be dolls when people were in the room, but she could hear them laugh and play through the baby monitor. That's about as far as I got before we had to leave, so I put the rag back on the shelf, but my 8 year old brain kept churning that information. When you don't watch them they come to life! Later that day I sat in my room watching my little 13" black and white TV, avoiding eye contact with the doll. It seemed like every time I'd turn my head, I would swear the thing moved. Any tiny noise was blamed on THAT doll, as I began to call it in my head. I would lower the volume on my TV and strain my ears and swear I could hear it breathe! That night as I lay in my bed, I was overcome. I couldn't sleep. If I slept THAT doll would come to life and kill me. I was certain. So I got up and did the only thing I could thing of to do. I grabbed the doll and snuck into my parent's bedroom and stuck the doll in my baby sister's crib. My rationale? If it wanted to taste blood, it could start with my sister. That would give me a head-start. I never told my parents that, though. In the morning when they found the coveted Cabbage Patch Kid in my sister's drooling mitts, I said I was giving it to her as a gift. My parents thought I was being a generous and loving big sister. I smiled and accepted the praise when in reality, I was nothing more than a coward, afraid of a doll, willing to sacrifice my sister to save my own hide. And the funny thing is, I'm still creeped out by Cabbage Patch Kids, to this very day.